After a short stint in the army (! ), the officer – who only later became Swami Vishnu-devananda – came across a copy of Sadhana Tattwa, spiritual instructions, by Swami Sivananda. By accident? Who knows. He got hooked, immersed himself in the study of yogic scriptures, and eventually was longing to meet the author in person. He packed his bag and went to Rishikesh (even at the time, everything YOGA seemed to have happened there…), where he was about to have a life-changing experience. It all took place on the stairs of the ashram where Swami Sivananda was residing, which were leading to the Ganges. 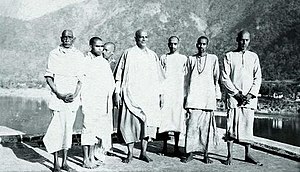 Swami Sivananda was walking up the stairs, and people were customarily prostrating to him. But the young officer did not want to bow his head to anyone. He hid in a doorway thinking nobody would see him, Swami Sivananda would pass by, and he could keep his pride, keep his shell intact. However, Swami Sivananda did see him. What do you think happened? He stepped in front of the young man – and prostrated to him. He gave him a lesson much more powerful than any lecture he could have given, any book he could have written. He led by example, giving him a lesson in humility. The first lesson for Swami Vishnu by his guru. In 1947, at the age of 20, Swami Vishnu took sannyas (became a monk) and entered the Sivananda Ashram in Rishikesh. The rest is history, but the lesson remains timeless. Fate is when God chooses to remain anonymous. What is fate for you? I have been poking around your blog and I really love your writing voice. I look forward to reading so much more of your inspiration! Catching up on blogs after a vacation and I can’t even begin to tell you how this post speaks to me & where my life is right now. I have read it a dozen times and will keep reading it for many moons. Thanks for this! Honestly, in all my readings I dont think I had heard (read) that story. Its great! Fate? God Anno? Destined to happen? Who really knows. I love the idea that the universe is always lighting up the path, but sometimes we are so resistant that we miss step or get lost and the Universe has to get in our face to get our attention; or have the Guru bow to us. In the Movie Gross Point Blank Minni Drivers character told John Cusaks character that what he needed was a Shakabuku, it’s a Buddhist term basically means ‘A swift spiritual kick to the head that alters your life forever’. Sometimes Fate gives us a pretty rainbow for inspiration, sometimes its Shakabuku, sometimes it’s the Guru reminding us about true humility. Love it!